Touching this cursed clip instantly installs it in your soul. While under the influence of the Clip of Annoyance, it will appear at inopportune moments and loudly suggest terrible plans. Do not be fooled by the wide eyes and smile, behind the clip’s gaze lurks a soulless monstrosity most foul. When the clip appears, you must succeed on an intelligence saving throw of 5 or feel compelled to trust it. Following the clip’s advice willingly (not via failed saving throw) will rid you of the curse. The Clip of Annoyance will then materialize in your hand and curse the next being who touches it. 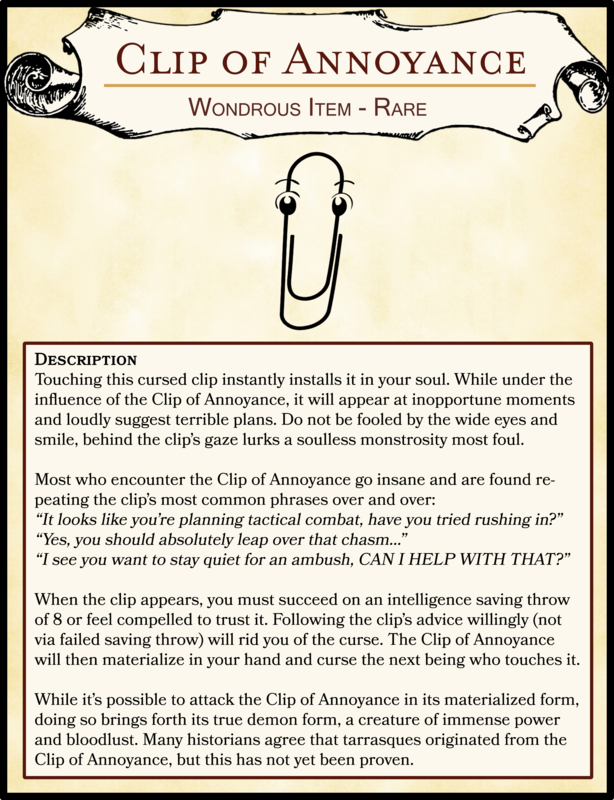 While it’s possible to attack the Clip of Annoyance in its materialized form, doing so brings forth its true demon form, a creature of immense power and bloodlust. Many historians agree that tarrasques originated from the Clip of Annoyance, but this has not yet been proven.